The Mount Horeb Area Historical Society (MHAHS) is commemorating the 150th anniversary of the close of the American Civil War, whose effects upon our country still resonate, with a Civil War-themed weekend of activities on June 6 and 7. The planned events, a children’s day camp and outdoor concert, add even more variety to the 9th Annual Spring Art Tour (a successful undertaking of the Mount Horeb Area Arts Association) that takes place the same weekend. 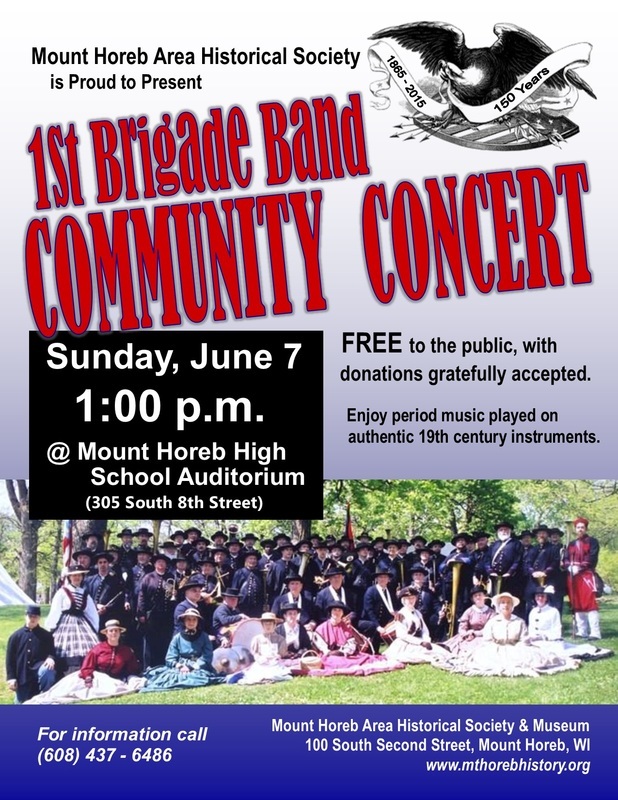 MHAHS is very proud to be hosting a free concert by the acclaimed 1st Brigade Band, to be held on Sunday, June 7 from 1 p.m. to 2:30 p.m. at the rain location of the Mount Horeb High School Auditorium (305 S. 8th St.), due to a gloomy forecast. To reiterate--the 1st Brigade Band Community Concert WILL NOT be held outdoors on the Society's future museum site at 106 S. 2nd, due to inclement weather. The 1st Brigade Band is an homage to the Brodhead Brass Band, which enlisted in the Union Army in 1864 and served under the famous Gen. William T. Sherman. The band makes this intriguing history come alive by presenting period brass music, performed on antique instruments, while attired in 1860s era uniforms and gowns. This concert is made possible by a generous donation from Andrew and Linda Burkart of the Mount Horeb Area Historical Society, and will be dedicated to the memory and bravery of Alonzo Cushing of Delafield, Wisconsin. Cushing, who lost his life at the infamous Confederate surge known as Pickett’s Charge, was posthumously awarded the Medal of Honor by President Obama just last November—151 years after he gave his life for his country. In addition, the Mount Horeb Area Museum & Gift Shop (located at 100 S. 2nd St.) will be open from 10 a.m. to 4 p.m. the day of the concert, with volunteers on hand to show guests the Society's newest website database--an alphabetized list of Mount Horeb area citizens who served in the Civil War, with relevant biographical information. While at the Museum & Gift Shop, also be sure to check out our new 2015 inventory! For more information related to June’s “Civil War Weekend,” email mthorebhistory@mhtc.net or call 608-437-6486. The Mount Horeb Area Historical Society is a nonprofit organization dedicated to preserving and sharing the unique history of Southwestern Dane County. MHAHS is proud to celebrate its 40th anniversary in 2015. Please consider donating to activities like June 7th's Community Concert.